MailStyler 2 is the best newsletter template builder you can find on the market. Although it’s a software designed for Windows, it’s easy to use our software on a Mac. We explain how in this post. First of all, it must be specified that there are two main ways to work on a Mac in Windows environment: virtualization, i. e. the launch and use of an entire operating system as if it were a regular application, and native installation via Boot Camp. In both cases, you will need to buy a Windows license to install on your Mac. Boot Camp is a MacOS feature that allows you to create a partition on your Mac where you can install the latest versions of Windows: with Boot Camp you can choose which operating system to use at boot time (macOS or Windows). To do this, you need to have an ISO disk or an ISO image containing the Windows installation at your fingertips. Start with Boot Camp Assistant, which is usually found in Applications > Utilities on any Mac, which will install the operating system itself. Insert a USB stick or external disk and then launch Boot Camp Assistant. Follow the on-screen instructions, and choose the size of the partition that will be used by Windows. Please note that, once you have selected it, the size of the partition cannot be changed: if you plan to use Windows often, it is better to give it enough disk space: Apple recommends at least 32GB. Boot Camp Assistant will make sure you reboot your Mac and enter the partition dedicated to Windows by launching the OS installer. Then you’ll have to follow the on-screen instructions, taking care to select the Boot Camp partition as the boot disk for Windows. The alternative to a partition dedicated to Windows is a virtual machine, a virtualized partition: in this way, you will use Windows as if it were an active app. To do this, you can use different software solutions: for simplicity, we will talk about Parallels here. We also assume that you have obtained a version of Windows to install, as for Boot Camp. To get started, you need to purchase a Parallels license directly from their site. Once installed, launch it and create a new virtual machine. From there, follow the on-screen instructions and install Windows, starting with the ISO image or a DVD or installation stick. Once the operating system is installed, using it is very simple: just launch Parallels, and it will be as if Windows were an application that you installed on your Mac. Although Parallels is a great program, expect you to slow down in some resource-hungry passages: an entire operating system is not a little thing to virtualize. 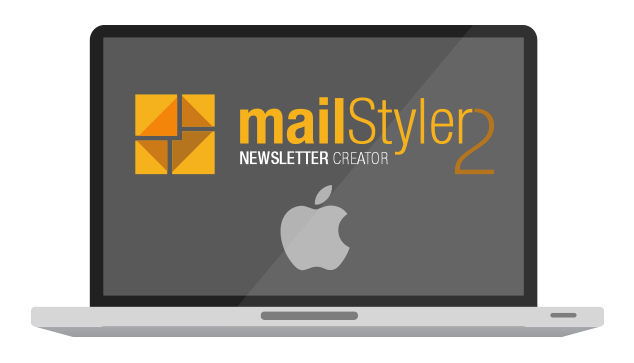 Using MailStyler 2 on your Mac, whether you’ve installed Windows via Boot Camp or Parallels Desktop, is the same as usual. You will need to download MailStyler 2 from our website and follow the activation procedure. Once the installation and activation are complete, you’ll be ready to create great professional templates for your newsletters.